A short desciption to those not familiar with this little piece of software. More in detail is to be found at the websites of Audioease, the developers of the Altiverb. www.audioease.com and Trillium Lane, the developers of TL Space. A convolution reverb is a plugin for sound editors like Digital Performer, ProTools, Logic and Cubase VST. It is a room simulator and it works with samples from real acoustic spaces. These spaces are 'captured' using a special sweep tone played by a speaker and recorded by microphones in the actual space, or by firing an alarm pistol and recording that with microphones. 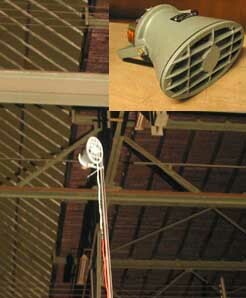 A convolution reverb adds the same sound to any sound that it is used on as what the room did to the gunshot or sweep. This sample is called an impulse response, in short: IR. Since i bought Altiverb i started making my own impulse responses. I always dreamed of having the echo of a forest in my studio. Now its here. And the echo of a small street. Now its here. On this page you will find some IR's i made until now. They are here for free, but if you make a cd with it you owe me a copy! I often get mail of PC users of a similar program like SIR requesting for wav files. I converted some IR files to 24 bit interleaved .wav. But please don't send me mails if i would like to convert the rest of the ir's or how to convert them to use for pc. Its a lot of boring work, and personally i have no use for the files. Find a friend with a mac to do that for you. I am a fan of using all kinds of small speakers and using them in a space to alter sounds with that. I am a sound editor for film and television and i regulary have to make sounds like answering devices, sound of a television in the background, a telephone conversation etc. And i often play back a ticking clock by a speaker in my living room in order to make the clock sound like a part of a living room atmosphere instead of a time bomb ready to explode. So i made a set of recordings from my favourite speakers and old tube radio's. As i am still a newbie of making good IR's i have called them version 1.0. They are freely downloadable here but if you make a cd with it you sure owe me a copy! They are available in both mono to mono and the speaker IR's also in mono to stereo. In the mono to stereo i also captured the small wooden cupboard they where placed in. I used a two Shoeps CMC5MK5 omni's 40cm spaced to achieve a superb realistic stereo image. Here it sound as if the sound is not coming out of my speakers but from somewhere in the room. Please tell me how it is for you. Please mail me your comments. with a starter gun to get the best SN ratio. 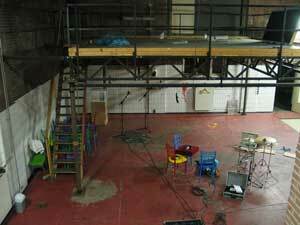 I also captured a small pa horn in this hall using the sweep played back by this pa horn. 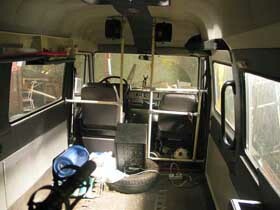 The interior of a small van, a Mercedes. Captured with a Genny S30 faced backwards and using two Schoeps CMC5 MK5(omni's). Jef Nassenstein digged up this nice old spring reverb with tube amplifiers. This inspiring tape echo has too many nice settings to capture, so you'd better find a real one instead of this IR, but they make a good alternative. Finally; a forest. I dreamt for it for years. Lage Vuursche in The Netherlands. Its not perfect, but it does sound like a forest. 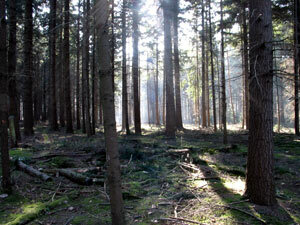 My goal was to make a dry recorded shouting voice as if it was recorded far in a forest. Mute the direct for 'far' sound. Add echo if you like. Typically a film/tv application. The result is highly dependand on what you use it on. On an average level spoken dialogue its not very natural. And i haven't tried it on drums yet...Please use this IR and let me know how it worked out for you. I am really curious. Here is my email. As i was on this location for a film shoot i couldn't resist doing an IR of this medium size church. As time was short i used a 6mm flobert starter gun, though high quality mikes; Sonodore omni's for stereo front and Schoeps CMC5 MK5(onmi) for rear. This is a mono to stereo or mono to quad IR. Great for strings. This unit is a very bright, splashy spring reverb. 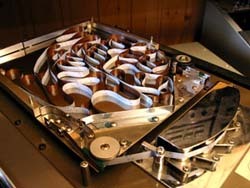 It contains two seperate springs to achieve a sort of stereo effect, although a dual mono is a better description because there is no correlation between the two springs. It was hard not to overload the springs during the capture. Even at very low inputs i could hear square waves, so i had to lower the inputs a lot. 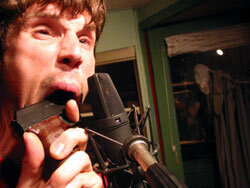 As a result the output of the unit became so low i had to use a mic preamp with approx. 50 dB gain to get a decent level in my AD converters. Of course a huge noise was the result. Beside the noise the unit became very sensitive. If i clapped my hands i could hear the springs going. So i used a 300 seconds sweep to get the best SN ratio. A friend of mine captured this reverb he owns. Nice gentle dual spring reverb. Mono in stereo out. 5 brilliance settings. Thank you Lee Sheppard. Frank van der Weij was recording a snare in this room and i couldn't resist dropping by to make an IR there. At home i was enthousiastic about the result on a snare, i used it several times since then. I have no idea if its nice on electric guitar, but i suppose so. 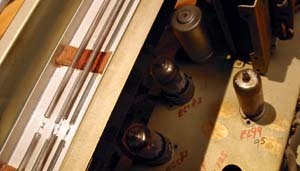 A pair of spaced Sonodores where used to capture the sweep coming out of a Genelec S30. I made two IR's; one close, one wide. The close is my favourite. See for yourself. 29 september 2002 Speakers and telephones version 1.0 initial release. 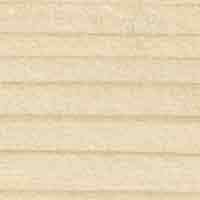 Without any comments from users posted on this website. Speakers and telephones version 1.1, some changes made by Audioease; phase en length. Speakers and telephones version 1.2 Added a car radio system and a small portable cd player close and wide. 14 december 2002; Claustrofobia IR set added. 17 december added the facory hall, the Mercedes van and Amsterdam living room. 12 january 2003 Added the Small Schellingwoude Church. 16 january 2003 Added an iron bath and a small tin can to Claustrofobia, and i also made all items also available as mono. 21 january 2003 Updated Amsterdam Living Room; added another living room. version 1.1 now. 27 january 2003 Added Lexicon PCM60. 27 january 2003 Added EMT 244. 18 february 2003 Converted most IR's to wav files as requested by some PC users. 7 march 2003 Added my bathroom. 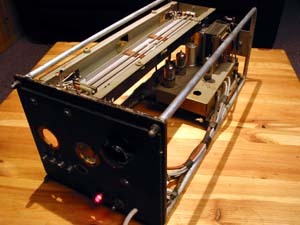 18 april 2003 Added the Vintage Spring Reverb. 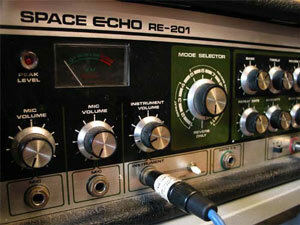 21 april 2003 Added Roland RE-201 Space Echo. 9 may 2003 Added a forest. 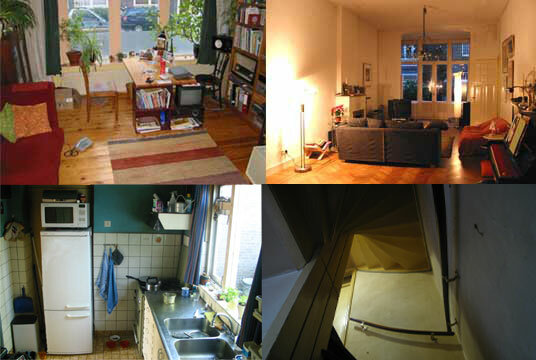 9 may 2003 Renamed the Amsterdam Living room to Domestic. Moved the bathroom IR in it, added a kitchen and a stairway. 11 may 2003 Added Streets. 13 may 2003 Added Mouth IR. 15 may 2003 Added Lexicon 200. 8 june 2003 Added Buiksloterkerk church. 10 june 2003 Added Roland DEP3. 10 august 2003 Deleted the Protools template session, and added aif sweeps for IR captures. 11 november 2003 Added Fostex 3180 spring reverb. 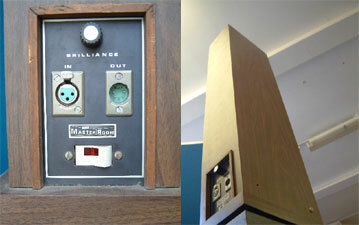 6 december 2003 Added Masterroom II spring reverb. 6 january 2004 Edited the folder structure of the EMT244, Lexicon PCM60, Forest, and streets. Now every IR has its own folder. 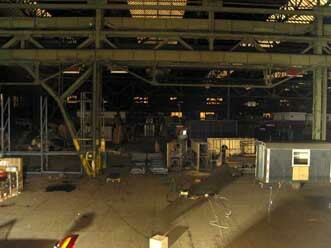 14 january 2004 Added Small Factory Hall. 2 september 2004 Updated some text and links. Note: these IR's are freeware. I distribute them as freeware because i hope it will stimulate you to make IR's for public use too. I often get mail of PC users of a similar program like SIR requesting for wav files. I converted some IR files to 24 bit interleaved .wav. 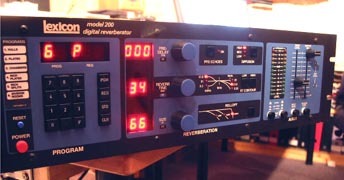 or if i would like to convert the Altiverb IR's. Its a lot of boring work, and personally i have no use for the files. Find a friend with a mac to do that for you. This set contains mono to mono and mono to stereo IR's of two old tube radio's, 4 kinds of differend speakers, 2 telephone horns and a walkman headphone. Version 1.2 adds a car radio system and a small portable cd player. Please unstuff this archive with Stuffit Expander and drop it in your impulse responses folder. I got requested by pc users for my impulse responses in wav format. Altiverb or TL space users should download the other file wich are sdII files. This set contains mono to stereo IR's of very small spaces like flower pots and dustbins etc. Please unstuff this archive with Stuffit Expander and drop it in your impulse responses folder. Including the PA speaker. Please unstuff this archive with Stuffit Expander and drop it in your impulse responses folder. I got requested by pc users for my impulse responses in wav format. Altiverb and TL space users should download the other file wich are sdII files. Please unstuff this archive with Stuffit Expander and drop it in your impulse responses folder. Formerly known as Amsterdam living room, and Bathroom wich are now combined. Now with also a kitchen and a stairway added. Please unstuff this archive with Stuffit Expander and drop it in your impulse responses folder. Bad news; the site from David Das, http://altiverb.daw-mac.com, is down. A site from a friend in Germany Click on Berthi to get what he has captured. Noisevault a site with impulses for PC. They are in .wav format, convertable to sdII for Altiverb or TL space. Audioease. The makers of Altiverb. Trillium Lane. The makers of TL space. The Yahoo discussionboard of Altiverb members.You need to sign in to be able to read and post.